HomeThis is CRM – done right! This is CRM – done right! After 18 months hardened battle testing with a number of our beta clients, LeadMachine is now open and public. 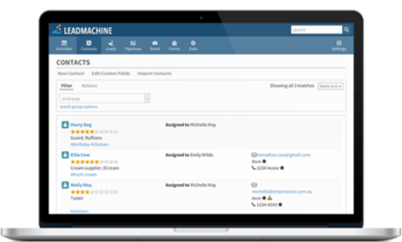 LeadMachine has a long list of powerful features, combined with awesome simplicity and an automation engine that will make your most boring and repetitive tasks trivial. CRM systems are traditionally either very complex databases, or advanced “to do” management tools. LeadMachine is designed to have all the power and features you would expect in any high end CRM system, but with an advanced automation engine to allow you to avoid unnecessary manual tasks, and to let you focus on your real sales and marketing processes. Despite this power, our key design objective was always making LeadMachine easy to learn and simple to use. Unlike some other CRMs, we didn’t bolt automation on as an afterthought, it is built into every feature. Define a Search Group for your Contacts, create a new Lead for those Contacts, send a templated Email to the entire group, track the URLs they click on, and let our Rules move them through your Pipeline. And unlike other CRMs, you don’t need to write code against our API to use all these features – they are all easily accessible by choosing your options through our application.